In the bowl of a standing mixer, set with the paddle attachment, beat the egg whites at medium speed until stiff, but not dry, peaks form. Remove the bowl from the mixer. In another bowl, combine the all-purpose flour with the salt and cumin and whisk in the Mexican beer. In 4 additions, gently fold the flour mixture into the egg whites, taking care not to deflate the egg whites. Pour the oil into a heavy, wide skillet or casserole to a depth of ¼” and heat over medium heat for at least 5 minutes. Test the heat by dipping a wooden spoon or the tip of a piece of fish into the oil: it should bubble happily around whatever you introduce into it. Set a cooling rack on a baking sheet and cover the rack with paper towels. If you don’t have a cooling rack, just cover the baking sheet with paper towels. While the oil is heating, you can season and flour the fish strips. Season them lightly with salt and pepper. Place flour on a plate, and gently press each fish strip into the flour, flip over and flour the other side. Tap off excess flour and place on the rack. When the oil is hot, one by one, dip the floured fish strips into the batter and immediately, but gently, place into the hot oil. Add as many as you can without crowding the pan. Fry until crisp and lightly golden brown, which should take 2 to 3 minutes; then flip and fry on the other side, for another 2 to 3 minutes or until crisp and lightly golden. Remove with tongs - the type with the heat-proof coating on the ends are best, if you want to avoid tearing the batter - or a slotted spoon and place on the paper towel-covered rack. Cover loosely with foil to keep warm. Serve on a flour tortilla with salsa macha and creamy slaw. Optional, pickled red onion and a jalapeño marinated in fresh squeezed lime juice and salt to taste. Best find from this great recipe was the salsa macha. WOW! What flavor. I’m going to keep a pot of this in the fridge for quick chicken, sweet potato and sweet pepper bowls. This satisfied all our umami tastebuds. Thanks Pati!! Super! I sometimes eat it right out of the jar…. It’s funny that I accidentally made these with corn tortillas (hey, my best excuse is that I was recently watching your video about which kind of tortillas are most often used…) and only after serving them I noticed it calls for flour after all! Never mind my mistake, they were positively good with flavors working in very delicious complement together. Oh they are so good either way! Thank you for tuning in, Mishel. Best fish tacos ever!!! After moving from So Cal to the East Coast my husband and I were craving some authentic food inspired from south of the boarder. As we were randomly flipping through channels we saw you cooking these and and couldn’t stop watching. Thank God for you and your cooking show and your recipies!!! This fish taco recipe was not only simple but also delicious (we used fresh wild caught cod and light corona). Even my 2 year old loved it! Thank you thank you, I’m excited to make more of your meals! I’m so glad you found me and the taco recipe, Jacquie! My Mom and I love your shows and the recipes! Every Saturday we watch then Sunday we try. Some weeks are more successful than others, but we always have fun. It’s a great way to spend time with my Mom! Oh please say hi to your mom for me, Sara! the best fish taco batter EVER… I used fresh salmon filet, cut as directed, and it was excellent! We just moved to Idaho from San Diego and miss the great fish (and shrimp) tacos from some of the local spots. The slaw mix was perfect, too. Actually had people talking about how good the slaw was. Only change I made was for the salsa macha. I wasn’t ambitious enough to make it, so I used one of my favorite “off the rack” salsas; Herdez Salsa Ranchera. Wanted shrimp tacos, too, and I had enough batter left over to do some shrimp, too. Taco Tuesday was a hit. Your Taco Tuesday sounds super yum, Bob! I live in Colorado and we do not have a good selection of fresh fish at our market. Can I use frozen filets or would you recommend only fresh fish? You can also use frozen filets, Jennifer. Enjoy! There isn’t ‘1’ recipe that we have tried that we weren’t blown away by. Looking forward to trying so many more. Thank you… and don’t stop sharing..
Aww thank you so much Tom and Linda! I love your wonderful dishes. 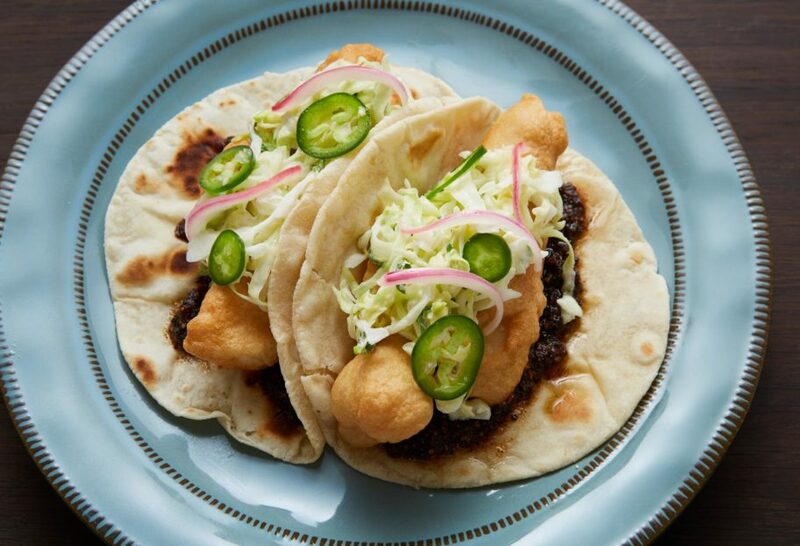 Living in Texas all my life and I have never found such a good recipe for fish tacos. I’m going to try, one time I made a fish fry using beer batter that was my wife’s recipe. It was quick and easy but it was the best batter! Your version looks lighter and puffy. Now I’m inspired to make my own flour tortillas. I want to try them with butter and salt too! Oh I’m so glad you were inspired, Michael! Enjoy the tacos and tortillas! !